The main goal of the program - to make the Internet accessible in the whole world. Agree, many hotspots are closed with password because at the dawn of Wi-fi - it was a kind of a policy to do so, just a habbit. Everyone tended to protect his Wi-fi network, not clearly understanding its essence and principle of operation, therefore protected his Wi-fi network as much as possible. Those days are gone, now protecting Wi-fi networks in many cases (especially if it is a public place or private network) - it's more a habit from the past than necessity. Passwords from Wi-fi networks are distributed "here" and "there", but this process causes some inconvenience: to find someone to ask, to hear the password properly, input it correctly. To automate the distribution of passwords this program was created. This software product - a small add-on on top of the connecting to Wi-fi process, something, what you do every time connecting to unknown networks. Instead of the standard interface, use it and share passwords easily. 1) Share the password from any Wi-fi network with other people. 2) Use passwords from Wi-fi networks that are shared by other users of the application. a) white with a lock: these are the networks on which the password is not yet known for application's users, they are closed and you can't connect to them if you do not know the password. If you do know the password from the network, you enter it through the application and, accordingly, share with everyone else who uses this program. b) yellow with a lock: these are the networks for which you do not know the password, but at the same time it has been shared by someone who was in this place before you. If the password is still relevant, you can connect to the network without any problems, if no, you will be prompted to input password, and thus update it. 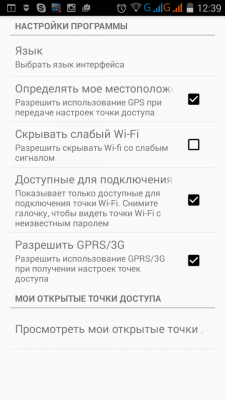 In addition to these three major categories you can also see networks without the lock either white or yellow which means they are not locked and you can connect to them. b) when you are not connected to the Internet, using passwords from its cache, but for this you will need to pre-download the latest database from the server through the application menu, select "Update Keys" being connected to the Internet, for example while you are at home and have access to the network. In the long term - to retrieve the keys in the specified radius from the point on the map - this is not yet implemented. This program is completely free and is designed more as a social initiative, rather than as a commercial application. Help each other to make the Internet more open. Actually there is a statistic at the moment for more then one year of working this app and there are about 1,5 millions of hotspots. Of course it covers more big cities but everything depends on users and their desire to share passwords. Currently available 2.10 version of app. In the updated version added function of resuming connection to lost wi-fi connection after unsuccessful attempt to connect to another hotspot. .
You can download updated 2.13 version of app from Google Play. 2) Bug fixing and optimization. 1) The problem with server connection was fixed. 2) The problem with map was fixed. Available updated 2.17 version of Wi-Fi passwords: use and share application. 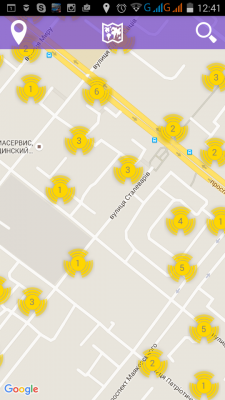 The authorization using Vkontakte has been added into application. You can download new version of app from Google Play!!!! It is pretty good that it can share the password from any Wi-fi network with other people. Currently available updated 2.20 version of application on Google Play. is it a non-english app? why the screenshot is not in english? New version 2.21 of application currently available on Google Play.